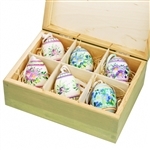 Our wooden boxes are handcrafted using Linden wood from the Tatra mountain region of Poland. These boxes are entirely decorated by hand, using various combinations of carving, brass and copper inlays, burning, and staining techniques. Choose from a wide assortment of playing card boxes, jewelry and sewing boxes, picture-frame boxes, or even one with a whimsical piano keyboard! Sure to please. 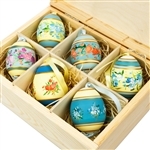 Book Style Polish Puzzle Box Boxed Egg Ornament Set - One Duck Egg - "Forest Evening" Boxed Ornament Set - "A Midnight Clear"
Boxed Ornament Set - "Bog Sie Rodzi" Boxed Ornament Set - "Gdy Sliczna Panna" Boxed Ornament Set - "Lulajze Jezuniu"